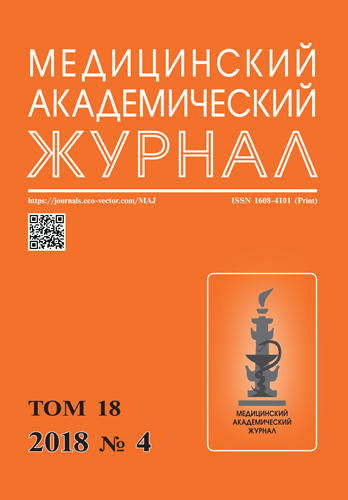 The journal “Meditsinskiy Akademicheskiy Zhurnal” published since 2001 is an official journal of the Northwest Branch of the Russian Academy Sciences. Its initiator and Editor-in-Chief in 2001-2009 was Academician of the Russian Academy of Medical Sciences Boris Ivanovich Tkachenko whose contribution to the development of the journal is invaluable. The first Deputy Editor-in-Chief of the journal was Academician of RAMS V.A. Nagornev, and its Executive Secretary was Corresponding Member of RAMS N.S. Sapronov. In September 2009, the position of Editor-in-Chief was taken by Corresponding Member of RAMS I.P. Dudanov, of Deputy Editor-in Chief, by Corresponding Member of RAMS N.S. Sapronov, and of Executive Secretary, by Prof. P.D. Shabanov. The high publication level and wide appreciation by specialists in the course of formation and development of the journal were ensured by outstanding contributors, including Academicians E.K. Ailamazyan, N.A. Belyakov, Yu.D. Ignatov, Yu.V. Lobzin, V.I. Mazurov, N.A. Maystrenko, and A.A. Totolyan, and Corresponding Members of RAS I.A. Yeriukhin, S.A. Ketlinskiy, M.M. Odinak, Ye.A. Selivanov, and S.A. Simbirtsev. Since 2010 up to the present time, Editor-in-Chief of the journal is Academician G.A. Sofronov. Since 2012, its Deputy Editor-in-Chief is Academician N.A. Belyakov, and its Executive Secretary is A.B. Dmitriyev PhD. The Editorial and Advisory Boards of the journal include prominent scientists representing the Northwest of Russia and distinguished scientific schools of Saint Petersburg. Since 2012, the journal is published by the publishing house Baltiyskiy Meditsinskiy Obrazovatelnyi Tsentr (Baltic Medical Educational Center). Belyakov N.A., Rassokhin V.V., Stepanova E.V., Leonova O.N., Boeva E.V. Tanianskii D.A., Parfenova N.S., Nikulcheva N.G., Denisenko A.D.
State guarantees of free medical care: What has changed in 20 years? Ishuk S.A., Bogomolova E.G., Dobrovolskaya O.A., Akhmetshina A.O., Krasnoshchek D.S., Lukovenko A.A., Fedorova E.A., Klyus A.M., Kolmakov N.N., Zherebtsova J.V., Dukhovlinov I.V., Klimov N.A., Simbirtsev A.S.
Zharkova M.S., Umnyakova E.S., Afinogenova A.G., Afinogenov G.E., Kolobov A.A., Shamova O.V. Shamova E.V., Grigorieva D.V., Gorudko I.V., Sveshnikova A.N. Muruzheva Z.M., Ezhov A.A., Karpenko M.N., Fominceva M.A., Klimenko V.M., Stolyarov I.D. Zakharova E.T., Kolmakov N.N., Sokolov A.V.